Der T-45 ist ein sowjetischer premium leichter Panzer der Stufe 2. Die aufgerüstete Version des Panzers T-60. Im Gegensatz zum ursprünglichen Fahrzeug hatte der T-60 eine verbesserte Panzerung und einen Turm mit einem 45-mm-Geschütz von 1938, sowie ein koaxiales DT-Maschinengewehr. Im Juni 1942 wurde das Fahrzeug im Vergleich zum T-70 als veraltet angesehen. Das Fahrzeug erreichte keine Serienreife. Ein gebauter Prototyp wurde jedoch an die Front geschickt. 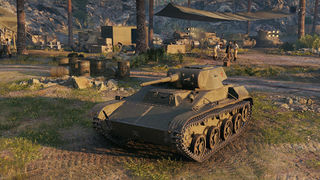 Premium tank offered by WarGaming in its18th anniversary. The T-45 is a Tier II Premium Russian Light tank that performs very similarly to the T-60, its normal Russian counterpart. Its decent top speed, acceptable gun and fast traverse speed can outmatch a lot of its tier 2 light counterparts. 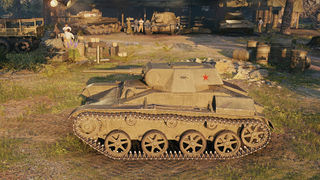 Its 45 mm 20KL, which bears striking similarities to the gun of the MS-1 which is also mounted on the other tier III and IV Russian premium lights, has a decent penetration value and thus can penetrate most of its enemies frontally, including the heavily-armoured LTP, BT-SV and T-127 with relative ease, but neglects alpha damage in return and so the T-45 will need to expose itself for a longer period of time to cause the same amount of damage as a TD. You can use it as a flanker, but choose your targets wisely: A good amount of your adversaries will be able to outmaneuver you. 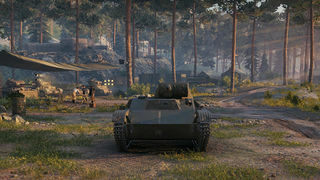 You will often bounce shells off of your heavily sloped upper plate and thick frontal turret armour, even if not angled, but even your sloped armour can't withstand heavier tier II-III guns like that of the LTP and T-127, so be careful if you face TDs and tanks at tier III and above. Your gun is adequate and will do the job without problems the majority of the time, however it's not always a reliable tool: it's not as accurate as other tier II lights (Its soft stats are even worse than that of the MS-1 a tier lower), so it's best to have cover or find a hull-down position to exploit your 51mm of frontal turret armour, and your armour will be at worst a 50-50 chance of being penetrated - As you are constantly penetrating their armour with your 51mm of penetration on the gun. Himmelsdorf is an excellent example of this where this tank can prove its worth. However, its weak spots are large including the middle commander plate and the lower glacis (however they are 10mm thicker than the upper glacis) and it is difficult to snipe due to its lousy accuracy and aiming time. None whatsoever as this is a premium tank.